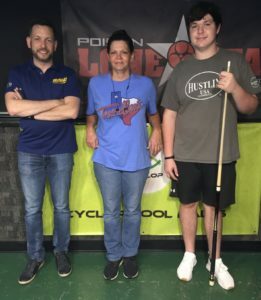 Joey Bourgeois, Jr., of Baytown, Texas, ran through the 64-player, amateur 9-ball division, in the Poison Lone Star Billiards Tour, Texas Open Warm-Up 9-Ball Event, defeating Austin newcomer Jude Rosenstock in the final set, 5-1. This marked Bourgeois’ second, consecutive victory, in his Tour career. 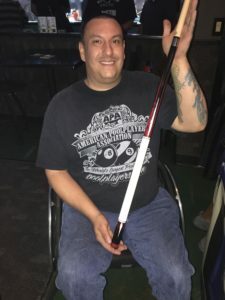 In the 64-player, open 9-ball division, local favorite James Davis, Sr. took down Jude Rosenstock in the final, 6-3, securing his fifth win on Tour, of the past nine Tour events held at Skinny Bob’s. Rosenstock came very close to winning both divisions, a feat only one player has accomplished in the Tour’s ten years, while Austin’s Kim Sanders became the highest female finisher in an open or amateur division, in Tour history! 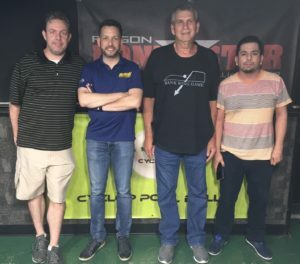 On August 4th-5th, 2018, Skinny Bob’s Billiards in Round Rock, Texas, along with tour title sponsor Poison by Predator Cues PoisonBilliards.com, and sponsors Cyclop Pool Balls, www.VaporKnightsUSA.com, APA of North Harris County, and OutsvilleBilliards.com, facilitated another successful event for the players of the Poison Lone Star Tour. Skinny Bob’s added a generous $1,000 to the two-day event, which paid out a whopping $8,745. The Tour would like to thank room owners John and Sue Cielo for their continued support, nine years running! Each 64-player division kicked-off on Saturday afternoon, and brought back the final 32 in each, on Sunday. In the amateur 9-ball division, Joey Bourgeois, Jr. began his journey to the winners’ side final four with wins over Daniel Campos, 5-4, Mike Hoffman, 5-4, Nancy French, 5-1, and Jacob Case, 5-2, as Jose Ybarra tagged San Antonio’s Vance Rodriguez, 5-0, Lazaro Martinez, III, 5-2, Ryan Lane, 5-4, and Michelle Cortez, 5-4. Florida’s Chris Gentile plowed through Joel Acevedo, 5-2, Danny Wyatt, 5-1, J.C. Torres, 5-1, and Kim Sanders, 5-0, while Jude Rosenstock denied Chuck Adams, 5-3, Eddie Palmer, 5-1, Ricardo Espinosa, 5-3, and Shane Hvamstad. On the one loss side, J.C. Torres fell to Matt Wong, 4-2, and Oklahoma’s Micah Ott eliminated Ricardo Espinosa, 5-3. Kim Pierce passed Ryan Lane, and Eddie Palmer sent home Benito Cazares, 4-0. Wong was eliminated by Case, 4-1, and Cortez was shut out by Ott, 4-0, while Pierce caved to Hvamstad, 4-1, and Sanders dusted off Palmer, 4-2. Back on the east side, Rosenstock slid by Gentile, and Bourgeois, Jr. edged out a victory over Ybarra, both by the same score, 5-4. In the hot seat match, Bourgeois, Jr. eased pass Rosenstock, 5-4. On the west side, Case defeated Ott, but fell to Gentile, while Sanders ousted Hvamstad, then derailed Ybarra. Sanders went on to eliminate Gentile, 5-4, but fell to Rosenstock. Sanders settled into third place, becoming the highest female finisher in a Poison Lone Star Tour division. In the finals, Bourgeois, Jr. fought to avoid another hill-hill match. He ended Rosenstock’s run, 5-1, securing his second Tour victory of the 2018 season. In the open division, James Davis, Sr. overcame Michael Parrott, 6-0, Laz Martinez, III, 6-5, Jacob Watson, 6-2, Laz Martinez, Jr., 6-2, and while Jason Roessler defeated Chris Habgood, John Demmett, 6-3, Justin Wright, 6-1, and Kim Sanders, 6-3. First-timer, Jude Rosenstock cut through Rene Rodriguez, Jose Ybarr, 6-5, Joel Acevedo, 6-4, and Paul Jobe, 6-1, as Jimmy Krone powered past Mike Englund, Vance Rodriguez, 6-2, Ralph Cardona, 6-5, and Benito Cazares, 6-5. On the west side, Eric Aicinena eliminated Joe Heinaman, 5-1, but fell to Jobe, 5-4, while Joey Torres took out Ybarra, and Cazares, 5-3. Upset by Ybarra in the first round, open-only player, Ruben Escalera, struck down Ryan Lane, and Kim Sanders, 5-0, marking up six wins on the one loss side, as Acevedo upset James Davis, Jr., 5-4, and Laz Martinez, Jr. Down to the final eight, winners’ side final four witnessed Davis, Sr. defeat Roessler, 6-1, and Rosenstock roll Krone, 6-0. In the hot seat match, Davis, Sr. wasted little time, overwhelming Rosenstock, 6-1. Back on the west side, Jobe edged out Torres and Roessler by the same score, 5-4, while Escalera ended Acevedo and Krone, both sets, 5-2. Escalera iced Jobe, 5-0, checking off his ninth win on the one loss side, but faltered against Rosenstock, losing 5-3. This was Rosenstock’s first Tour event, and first trip to the finals, where he faced the indomitable, James Davis, Sr. Although Rosenstock gave it his best shot, Davis Sr. took control and maintained the lead, securing his fifth Tour victory, 6-3. The Tour would like to thank all the new players, some of which traveled from great distances, who competed in this event, and congratulate players who reached milestones. 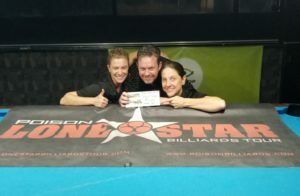 Paul Jobe achieved his highest finish to date, while Jude Rosenstock and Kim Sanders also made great strides, Jude finishing second in both divisions, and Kim, becoming the highest finishing, female player in a Poison Lone Star division. The Tour would also like to thank tournament co-director, Erica Hanlon, for all her assistance in running the boards and ensuring a smooth, seamless event, and photographer Mille Almaraz who captured some memorable, tournament moments. Finally, congratulations to this weekend’s Poison raffle winner, Louis Acosta from Jarrell, Texas. Acosta took home a Poison Arsenic3-2 playing cue. The next event will be October 13th-14th, 2018, at Bogies Billiards West, located at 9638 Jones Road, in Houston, Texas. For more information, visit www.LoneStarBilliardsTour.com. Alongside the next Poison Lone Star event, there will be a Gulf Coast Women’s Regional Billiards Tour 9-Ball Event. For more information, visit www.GulfCoastWomensTour.com.